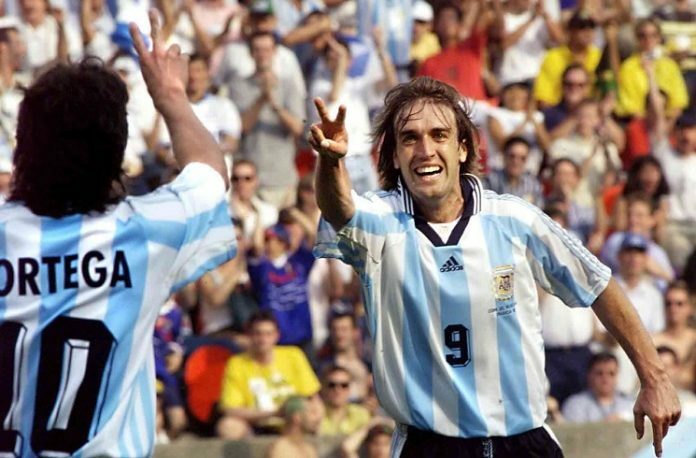 Ariel Ortega and Gabriel Batistuta with Argentina. Weeks before the 1998 FIFA World Cup, on April 22, 1998, Argentina played a friendly match in Dublin where they won 2-0 against the Republic of Ireland. A match which saw Gabriel BATISTUTA scoring one of his many, many goals for the Argentina team also produced an Ariel ORTEGA goal which still holds up 20 years later. The first goal came following a ball sent in from the left side which found BATISTUTA who slotted home from close range. Argentina’s second goal was magic by ORTEGA. With the ball glued to his foot, the number 10 toyed with the Irish back line and goalkeeper Shay GIVEN before chipping the ball over everyone and into the net. Before the start of the tournament I wanted Argentina to be in top3 so that they will be eligible to play in pan american games. But now when I think about it, I dont think any clubs are going to release their first team player for such a low tournament. The team probably would be reserves and u17. Anyway if batista can find one or two excellent players from reserves for WC then that is a good thing. 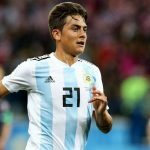 Worth to see talents that already have caps for U-20 team like Cristian Ferreira from River, Maxi Lovera, Moreno from Newell’s, Gaston Avila from Rosario Central, Andres Ayala or Pourtau, Mura from Estudiantes might play there as they still are not important part of their clubs. Yaa thats true, high chance for talents like Ayala, Ferreira ,pourtau in team. I think Lovera does play for central first team. Isnt Avila joined Boca juniors recently? Avila was going to join soon. Lovera position in Central, under Bauza-oldie lover is not that good as previously. Hope to see Martinez play today..
Spallettis Inter is just a dreadful team to watch. No creativity, all crosses and hoof balls to only 1 man in the box. Spalletti also not using Martinez at all except in the dying minutes. Wish our 2 strikers transferred to another team next season..or inter hire another coach. Oh boy, if Mr Training Wheels Scaloni is claiming that Benedetto is hands down our best #9, then he’s truly a f&*king moron. I actually do like Benedetto but that statement is delusional. Im not against Benedetto competing with Aguero/Martinez/Icardi and letting the best rise to top but not at the cost of not calling up our BEST #9 Aguero. damn im disliking this amateur more and more, that is..assuming Scaloni actually said that which may not be true. I hear Aguero is our best striker year after year but so far there was no evidence of that on NT level while some players goalscoring feats on club level are proven not to have straight translation into NT equally convincing performances. 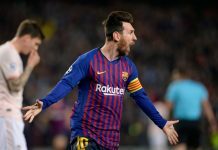 Second thing, Scaloni is probably afraid (me too) is back to old hierarchy in team by bringing again together famous pair of forwards Messi-Aguero, which, in fact, never showed on the pitch anything speciall about chemistry, that the two allegedly have off the pitch. One of them – OK. But two together it’s big risk of getting back old power relations, divisions for superstars and minor rest in the team, old guard and the new while we need to keep the refreshing atmosphere all players were talking about after Scaloni’s friendlies. We need new spirit. What’s the problem with calling Aguero was said above. Aguero is only better on paper. We have too many such paper tigers that are superstars on club level only. I don’t know how long you are following Argentina but we’ve been here before many times… with all that stunning club performances that never were translated into something similar in NT jersey. Scaloni has his reasons to call up Benedetto: none of Icardi, Martinez, Simeone, Aguero is type of hardworker while Benedetto is. Aguero might be more clinical but is nowhere near in that matter comparing to workhorse Benedetto. Maxi Romero might be better finisher than Gaich but with workhorse Gaich whole team just play better and render better results. Such logic. On club level currently Aguero is probably better than Icardi, Martinez, Simeone but that doesn’t mean he will influence better our team. Banedetto is different to all them because brings more of hardworking Pratto/Lavezzi’s style. One such forward in pack needed. No, the team started to build some chemistry and played better but not because of Gaich “hardworking”, the results were the same bad with him too at the start of the tournament, there was no difference with Gaich. very bad logic, makes no sense. We saw very little from Benedettos hardworking vs Venezuela, Ecuador or Nigeria. Aguero makes 2times more passes, touches in a match, he step back in the build up regularly, unlike Benedetto, whos vision and passing is so mehh. Vs Nigeria perfect example after Aguero injury, the team collapsed completely with Benedetto, Nigeria defense was so confident against him, no more nightmares of account of Aguero. Such logic. But with which of them team started to build better understanding: with Gaich or Romero? Of course with Gaich because he is hardworker and his influence on the team is better. To build better chemistry you need right elements and Gaich is such apparently element. So you contradicted himself because in fact Gaich is part of the better chemistry. I keep hearing there is no evidence but its akin to the climate change denialists. A mountain of evidence is right in front of them yet they keep ignoring or spinning the truth. Evidence: Aguero performed incredibly well in the last WC. 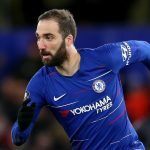 Easily one our best players. Evidence: Messi and Aguero had great chemistry during the last WC. Not only did Messi assist Aguero goals but against all odds and under immense pressure, Messi and Aguero connected in the dying minutes against France almost scoring the 4th goal. Evidence: Under Guardiola, Aguero has developed into a much more complete striker and contributes to pressing and build up play. Evidence: Aguero is currently the most inform striker out of all our options. Evidence: Aguero competes at the highest level is able tp play under immense pressure. “Mate bendetto will be 29 in may” – this is like tendencious people are when they don’t like some player. The 1998 jersey was a great one. Probably our last great one. I’ve still got mine. that is true. that jersey was one of the best ever we used. but i am not agree that it was the last great one. the jersey we used in last world cup was very beautiful one too and in 2002 world cup was one too that i find very beautiful. I am a fan of jerseys that have a collar. But I did enjoy the away one from the last World Cup. I dislike the ones that become fillers, i.e. Copa America jerseys and qualifier jerseys. Zero effort is put into them. Based on current form, the pecking order should be Aguero – Icardi – Martinez. I actually really like Martinez and relieved we finally have the next “Aguero”. He needs chances to develop, hopefully he starts getting more game time at Inter. I hope he will be more than just next Aguero, at least on NT level, because so far Aguero never was player who made a real difference in NT. He was just one of our strikers that always were either failing or injuring in most important moments. Argentina u 16 Vs Germany u 16 . Does anyone knows the result?